The Rehoboth Beach Writers Guild is founded on the belief that the writing–and sharing–of our stories matters. We are enormously proud of our many published writers, but publication isn’t our ultimate goal. What matters is the telling of the story, whether that happens while sitting around a table at a FreeWrite!, standing before an audience at one of our monthly readings, sharing drafts of one’s writing in a workshop– or publishing. 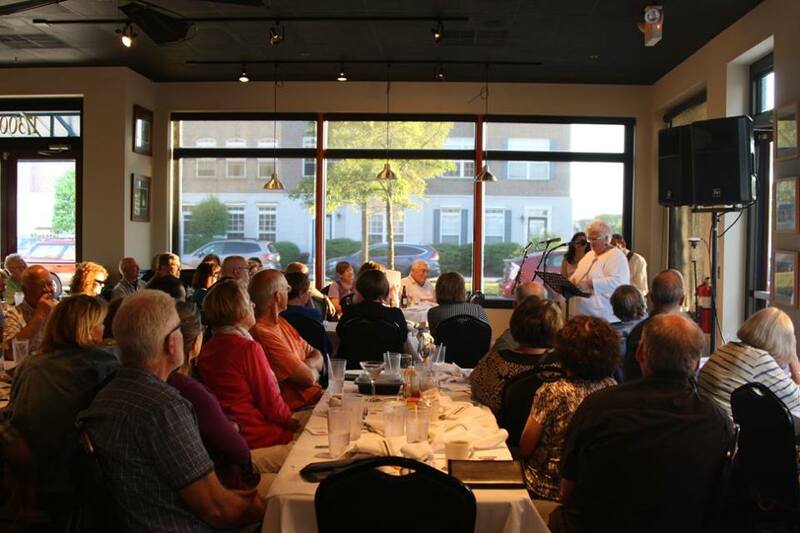 Regardless of a writer’s genre or skill level, the Rehoboth Beach Writers Guild offers education, encouragement and above all, a nurturing community of people who care about–and value–words. ​​If you’d like to become a member, click here for the Membership Application. You can mail in your application. The page also provides a link to Pay Pal where you can Join or renew your membership. Explore your writing passion! Attending a FreeWrite! is a fun, low-commitment way to dip your toes into the writing pool. We even have a session dedicated to poetry. Writers at all levels are welcome; you do not need to be a member to attend. See our FreeWrites! page for details. Second Tue of every month 7:00-8:15 p.m.
Join us monthly for a Night of Songs and Stories. The evening features original readings (300 words or fewer) by guild members and music by local musicians, Stuart Vining & Amy Felker. Each month a theme is posted and both the writers and musicians write/perform pieces that in some way connect to this theme. Go to Night of Songs and Stories to learn more about this consistently sold out event and to make a reservation for the next event. First Weds of the month 10:00-11:15 a.m.
Art in the A.M. is a monthly show featuring artwork, readings and music. Every month we post pictures of three pieces by local artists. Writers choose one piece that inspires them to write 300 words or less. On the day of the event, the visual artists show their work, writers read their stories, essays, poetry inspired by the work, and Stuart Vining provides the music that ties it all together. Third Thu of each month 5:30-7 p.m. Writing can be lonely. Sometimes we need to be with other writers to talk—or to listen to ideas related to writing—in a casual, free-style discussion. Guild members have expressed an interest in establishing a fixed place and time to work on their writing every week; therefore, we are beta testing Writers Writing. This is not a FreeWrite! session. It is an informal dedicated time to work on your writing project, a way to meet other writers and the opportunity to discuss what you are writing prior to the session, or after the session. We have a Writers Coffee and Chat at 6:00 p.m. on Weds at Panera that you are welcome to stay for as well. Post your book signing dates, etc. How: You must be an RBWG member and you must be on Facebook to use this new tool. On Facebook, search for RBWG Private Group; click on JOIN. Once the administrator has verified that you are a Guild member, you will be able to access the page. Delaware Beach Life (DBL), the premier lifestyle magazine of coastal Delaware, is a significant supporter of the Rehoboth Beach Writers Guild. Terry Plowman, publisher of Delaware Beach Life, is a board member of the Writers Guild. DBL has published many stories written by Guild members over the years. DBL offers Guild members a 20% discount on subscriptions when they enter: RBWG in the Discount Code box when subscribing or renewing online. To subscribe or renew your subscription to DBL click here, or visit their website.